DNSTrails is a new Internet service that provides you with the tools to find any domain someone owns among other things. The service has more to offer than that, as you may use it to display IP neighborhoods, display DNS and Whois records of any domain, and historical DNS data. DNSTrails is available as a public version, and a subscription-based version. 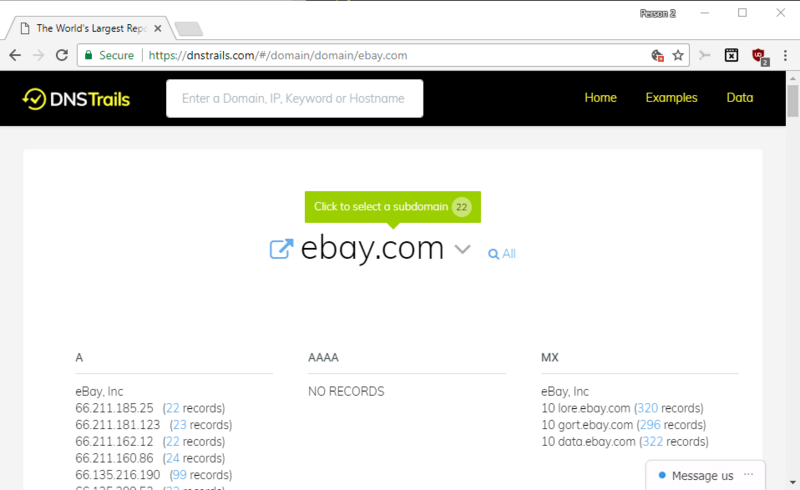 Anyone may use the search on the service's startpage to look up information on domains, IP addresses, keywords, or hostnames. DNSTrails displays detailed information on the site's current and historic data afterwards. Probably the most interesting feature of the service is that it highlights if an IP address, name, server, email address or other data is found in other records. The example screenshot above shows for instance that the listed IP addresses are used for other domains as well. You can click on the numbers to display them all in the interface. This is interesting for webmasters who use shared web hosting or other services that don't limit the IP address to a single resource. You can look up other sites that are found under the same IP address. This can be important to make sure that a site is not in a bad IP neighborhood (for instance if another site that is accessible under the same IP address got that IP blacklisted, or is of questionable nature). The same is true for Whois data. 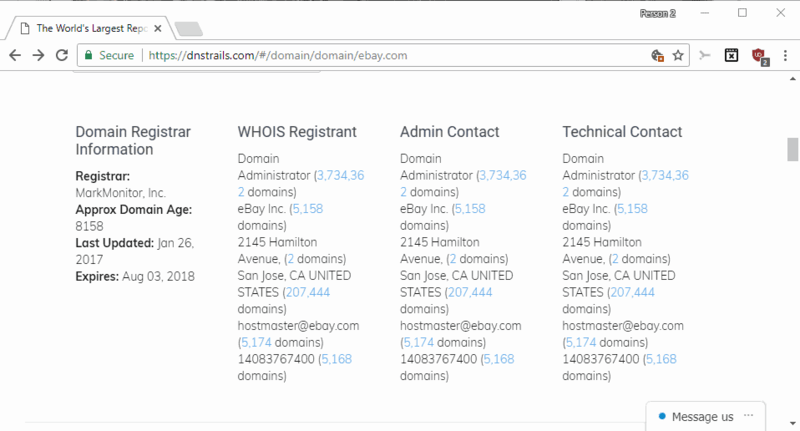 DNSTRails lists the Whois data on the results page, and lists the number of other records that use the same value here as well. You can click on a name, company name, email address or phone number of the registrant, admin or technical contact, to display all sites the record is found in. The accuracy of the data depends largely on what the registrant entered. Email address is usually more accurate for instance than name, as names are not unique but email addresses should be. A quick look up of my name for instance revealed several domains (among the 23 listed), that I never owned. In fact, most domains listed by the service were not mine, but some were missing. The last part of the results returns historical DNS data for A, AAAA, MX, NS, SOA and TXT records. DNSTrails is a specialized service that is probably most useful to webmasters and researchers. It may also be interesting to regular users who want to look up information on a domain or owner of a domain, for instance which other websites someone owns. url in first word, instead of https://dnstrails.com/, points to https://securitytrails.com/, which is neither free nor have adequate pricing for one-stop users. I’ve looked up a few domains and there were no results. If I lookup the same domains on e.g. network-tools.com, the DNS records show up in the result just fine. How does dnstrails populate the data? Hi Leo, thanks for your report. We would love to research the problem you are having with some domains. Could you send the affected domains to hello@dnstrails.com so we can have a look? Thanks for checking out the product and providing feedback. My favorite tool for looking up info on domains is https://centralops.net/co/ However this looks to be a possibly useful tool at times too. Thanks Martin. Hi Leland, if you are missing any features on DNSTrails please let us know at hello@dnstrails.com and we will look into adding it. We want to create a platform which helps you finding historical DNS records, domain WHOIS info and related information with ease.